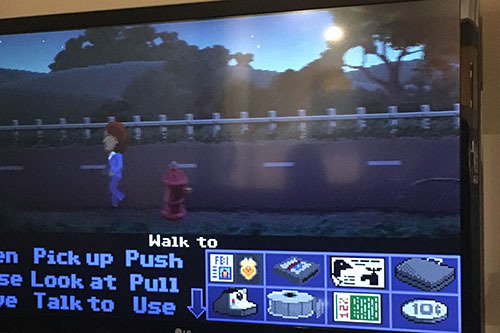 On Friday, we had our first playtest for Thimbleweed Park. 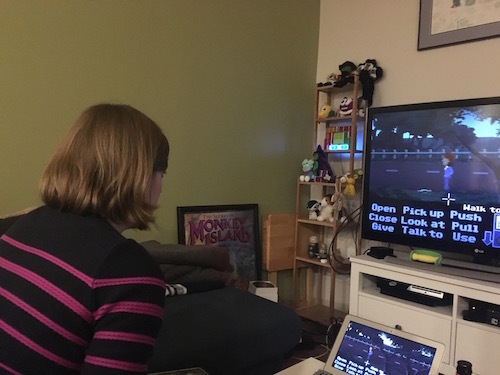 My friend Sarah came over and I watched her play the game for close to three hours. Next week Gary, David, and Robert will host playtest sessions with friends and family. Our goal is to do one playtest session every week until the end of the project in our elusive quest to "make a good game". There are different flavors of testing, each with a different goal in mind. Bug Testing: This done by testers who are focused on finding bugs in the game. While it is part of what they do, their main focus isn't on if the game is fun or not. They are playing the game over and over for weeks and months at a time looking for bugs and then taking the most elusive ones and figuring out how to reproduce them. They write up very detailed bug reports detailing what the bug is and how it happened. It is grueling work and can leave you hating the game (if not games in general). Good bug testers are very special and hard to find. Focus Testing: I hate focus testing and will never ever do it. Focus testing is where you bring potential customers in and see if they like something, and in most cases, before it has been built. Focus testing fails because people know what they like, but often don't know what they want. Focus testing is primarily used by visionless marketing departments. I will concede that focus testing might have a place in some kinds of products, but for art - which games are - it has no place. Rant: OFF. Playtesting: Playtesting usually happens one-on-one or with very small groups of players. You're often watching testers as they play, taking notes and generally being very quiet (if not behind one-way glass). Your main goal is to see how a player approaches the game, where they spend their time and where they are confused and get stuck. Back at Lucas, and I believe it started with Indy, we would have Pizza Orgies. After work, the whole Game's group, plus friends and family would get together, eat pizza and everyone would pay the game for a few hours, then we'd have a large group debrief discussion. These were great because everyone got to chime in and build off other comments. Alpha/Beta Testing: This is where you're sending hundreds (or in some cases thousands) of copies of the game to players and you're looking for big picture issues. The games often contain analytics so the developers can see how far people are getting and what they are doing. These tests usually involve a lot of people, so you don't drill down for specifics on each player. You're looking for global trends. Alpha/Beta testing is also good for finding bugs that only a fresh one thousand new players can find. ◼︎ Tell players you're just going to be watching and not talking to them. Don't engage in friendly chit-chat. Pretend you are behind a one-way mirror watching them. You need to make sure their impression of the game is playing the game, not talking to you. This is very important when players are friends and family. ◼︎ Ask them to talk out loud about what they are doing and trying, but not to ask you questions. ◼︎ Tell them there are parts of the game that are not finished and you might occasionally tell them not to do something so it doesn't break the game. ◼︎ Tell them this isn't a test of their ability, it's for looking at issues with the game. We expect them to be confused and have issues, that's what we're looking for. ◼︎ Try and be as invisible as possible during the playtest. ◼︎ Remember, we're not doing this as a validation that we're doing a good job (that will come later), we're doing this to see all the places we aren't doing a good job. Players not liking the game is a good thing because it's all stuff we can fix. ◼︎ Don't make excuses for the game. If you see a bug or a glitch, don't say "That's isn't supposed to happen" or "we're going to fix that". Most players won't even have noticed it. ◼︎ If the player takes a break for more than a few seconds, pause the game so we get an accurate count of the amount of time they played. ◼︎ Take notes on what people tried, not just when stuck but also as they explored the game. Did they go off in directions we didn't expect? Did they want to do something fun that we don't support. ◼︎ It's OK to ask people "What are you thinking?" or "What are you trying to do?" if they are not verbalizing, just try not to make it sound judgmental. ◼︎ Let players be stuck for long long periods of time. Don't hint players until they have been beating their head against something for 30 minutes or more. It's agonizing, but let them struggle, there is good information in watching how they struggle and what they try. ◼︎ The goal of the playtest isn't for them to successfully finish the game, it's to watch all the problems they have. ◼︎ If players are obviously stuck and are getting to the point of giving up, don't give them direct hints, instead ask them questions like "What are you trying to do?" and they will often figure it out just by verbalizing their thoughts, this also helps us figure out why people are confused. ◼︎ If they don't solve it, give them subtle hints like "Look carefully at your inventory" or "Make sure you've fully explored the City Hall". ◼︎ Players have a tendency to say "Is this what I should be doing?" and "Is this right?" when being watched, it's best to respond with silence. ◼︎ Be very careful when playtesting with friends and family. People don't want to hurt your feelings and will tell you nice things. Let them know it's OK to be very harsh and critical, that it helps us make the game better. ◼︎ Every time a player tells you something they don't like, the game gets a little better. ◼︎ You might have to draw the negative comments out of people. Try not to look pleased when players say nice things, this encourages them to just say nice things and not bad things. ◼︎ Don't ask leading questions. For example, don't ask if they liked the music, ask if they have any feedback on the music. ◼︎ Ask follow up questions to probe deeper. ◼︎ Ask them to describe the story. ◼︎ Ask them who Ray is and to describe her. ◼︎ Ask them who Reyes is and to describe him. ◼︎ Ask about the the other characters. We're trying to understand if the right information was conveyed. Don't respond to questions about the characters or story yet. ◼︎ Ask them if there was anything about the story that was confusing. ◼︎ Ask them if there was anything about the game that was confusing or they didn't like. ◼︎ Ask them where they were most frustrated. ◼︎ Ask them if they have any general feedback on the game. ◼︎ Ask these next questions last. ◼︎ Ask them what about the story did they liked. ◼︎ Ask them what about the game did they liked. ◼︎ At this point, you can answer questions and tell them what they might missed, etc. The playtest with Sarah went very well. She got stumped on a couple of puzzles that need better focus or clarification on our part. She got fixated on solving one puzzle that was leading her in the wrong direction, so we need to make it clear about it not solving the problem it appears to solve. There was one large backwards puzzle we need to fix. We were pretty sure it was going to be a problem and this confirms it. She wanted to call all the phone numbers she saw and we need to make sure they have satisfying responses. Having just played Maniac Mansion, she found all the references funny. After the first of the year, we'll post a call for playtesters who want to come in and play for a few hours and endure our icy stares, cold silence, and hip lab coats and clipboards. Oh boy oh boy oh boy! One half of me wants to be a playtester. The other half wants to wait until everything is properly debugged and polished to perfection and then enjoy a perfect old school adventure game! You can't see it, but I'm doing the "awesome update blog post" dance. These icons have really been polished a lot. Many of the first ones we were shown really looked as though they had had one pass at them, because I didnt imidiadly recognize what they were supposed to be. All of the icons here makes sense. I really hope the "hip lab coats and clipboards" are real. I bet Sarah doesn't even imagine how many people are envying her. You live too far from me... shame! great read nontheless, i think your approach to playtesting is very good because it happens early enough that things can still be changes and corrected instead of just finding bugs and glitches. also the art looks more staggering with each new room that is somewhat shown :). oh btw: after so many visuals, would it be possible to get an audio-teaser as well? maybe one of the shorter music tracks or the title music or something? i know the soundtrack is probably far from finished yet, but id love to have first impressions because it will be really important for the whole mood and atmosphere in the game. Ron, will you change the verbs so they start from the left instead of being almost centered? It looks a bit messy now. Agreed - unless you put shaded boxes behind each verb like Monkey Island. 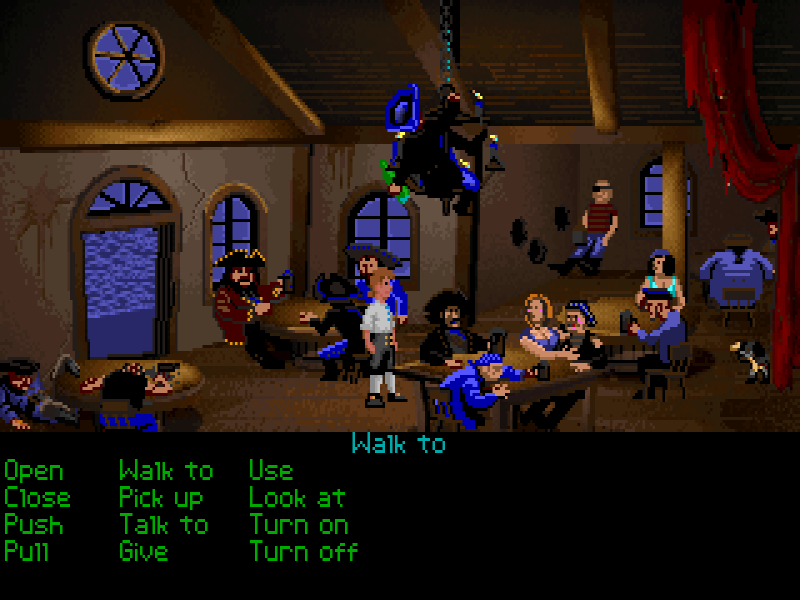 Monkey Island didn't have shaded boxes behind the verbs. 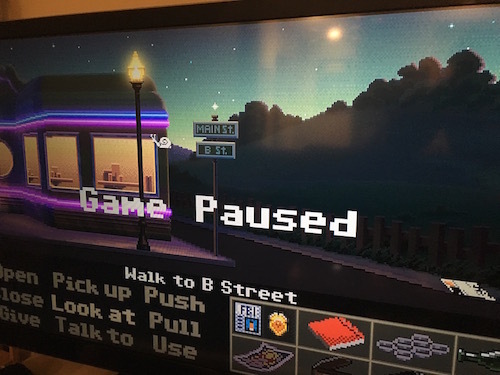 I tried left aligning the verbs in Thimbleweed park and I didn't think they looked good. The UI still has a long way to go, so stop panicking. That's only true for The Secret of Monkey Island. 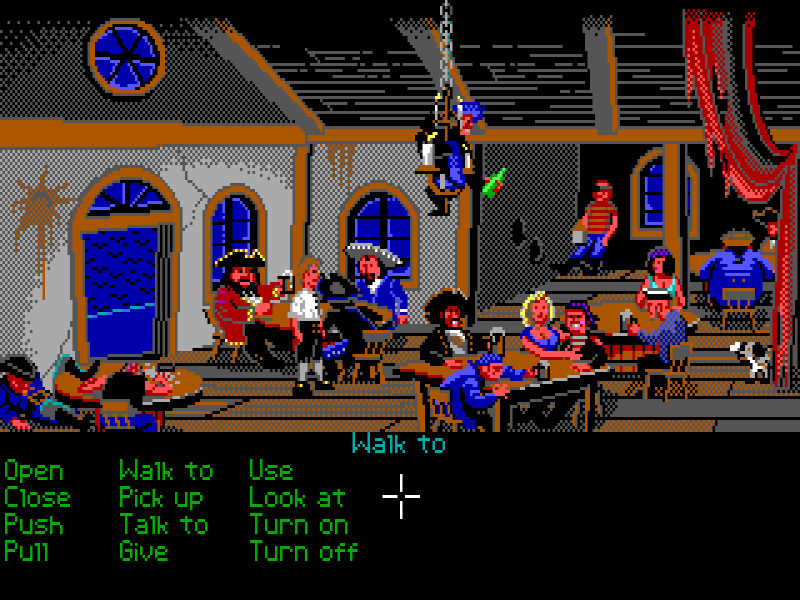 The Monkey Island 2 interface definitely had boxes behind the verbs. I've never played it with boxes. I've never seen them in MI 2 and I've never missed them as well. Sorry, I misunderstood you! I wrongfully thought about the dialog texts. You're absolutely right. I've also played MI2 with these dark purple boxes behind the verbs back then. For all I know they added the GUI from MI 2 to MI 1 when it was re-released on CD-ROM with 256 colors, albeit 3 verbs had to be dropped then. 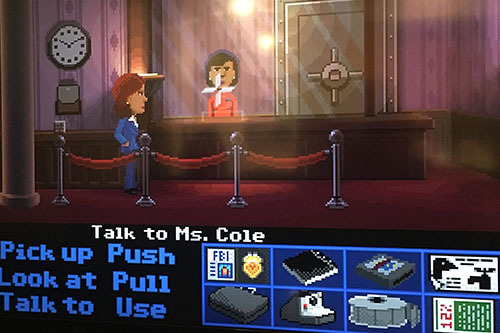 I even admit that this purple GUI design has been the most elegant I've ever seen in a point'n'click adventure game. For this reason I would be pleased if the GUI of TP would look more similar to it. Not the original. If you played a version with boxes around the verbs, it was done after I left. can you post a link to a screen shot? I'm curious now. I just checked in scummvm my "monkey madness" cd-rom version I bought in 1995-ish and it also has those boxes. If you want I can take some more screenshots, but I'm lazy and won't unless you ask me. P.S. Autocorrect doesn't know VGA?! Not hollow boxes, but rectangular filled boxes in dark purple, behind each verb. The first time I played it, on PC, there were filled boxes. The original doesn't have boxes behind the verbs, but the verbs themselves are definitely left-aligned. This proposed alignment would look a little less funky if you added margins, too. But, like I said, I think it looks fine. They will never enjoy the game when it's finished like us. That's a great idea! :-) If there will be a graveyard in the game. Great post! Playtesting (and to a degree, bug testing) is an aspect of game development that I think people are unfamiliar with. Of course, people understand that games are tested, but the way in which the information is presented, gathered, and processed - not to mention the knots in the developer's stomachs as they expose their creation to fresh eyes and opinions - is certainly still a mystery to many. Back in my C64 days, playtesting always used to be a process of showing the game to whatever friend happened to call round that day, and was often just a few nods, affirmations, and polite suggestions. Nowadays it's incredibly clinical (and almost scientific) in its approach. "Playtesting (and to a degree, bug testing) is an aspect of game development that I think people are unfamiliar with." Today bug testing is an aspect of software development that I think developers are unfamiliar with. It's good to see Ron & Co are not only serious about doing the playtesting and bug crushing, but actually have a good plan for it. It's not that most devs don't want to do proper bug testing, it just often is the part of the development most companies think they can be cheap on. And most modern games are so complex, that they would need over half a year of bug testing. Think of how expensive it will become, if you have a game with 20-40 hours of material. One tester needs weeks to play it through properly. And that's why things like Arkham Knight happens. I'd playtest the heck out of it for ya, Ron! You realize of course, this is torture! The screenshots are just looking too good. My theory is that the inside of the bank vault cannot ever be shown because Scrooge McDuck is in there swimming in his gold coins and Disney would've sued for copyright infringement. The skeleton! The Skeleton! 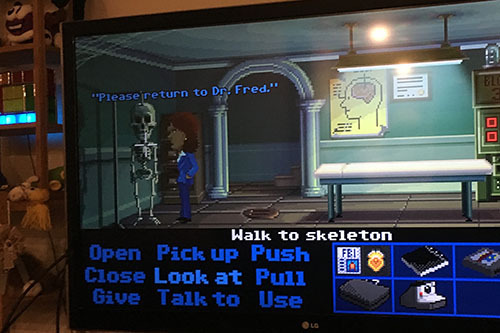 That's the medical room from Maniac Mansion..... Done in Ferrari style!!!! Wow!!!! I can't wait to play the game! It's great! Talk to Ms. Cole? I guess she has a name tag (the little thing I see?) or the agent have talked to her before because otherwise it should say "Talk to bank teller" or something like that. What's up with the icons? Why are they so good looking? 128! I totally forgot that existed! I went from the 64 to the Amiga 500. You are not alone... I am 42 too, I was 13 when played Maniac Mansion and 14/15 when played Zak McKracken. 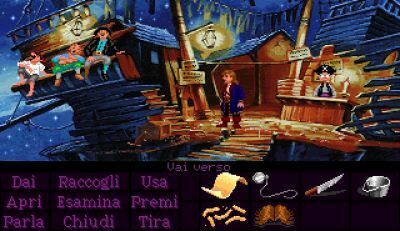 I have to say that those two games taught me a lot of English words... stale, couch, hamster, slimy, wax... none of those words you can learn in (italian) schools! Great post! I'm really enjoying your devbolog. The insight in to processes is quite interesting. As a content creator there's probably something I can take away from it when soliciting feedback on unfinished projects. Indeed, the snail is back! Hurray! 1) Does the game count the amount of time you play? It would be a very interesting function for the final version, too, for deliberating one's own performance afterwards! 2) Is there already music in the test version of the game? 3) What does 'backwards puzzle' mean? No, I don't like puzzles where you have to wait. Puzzle can become unlocked by doing other actions, but time alone shouldn't be the way. 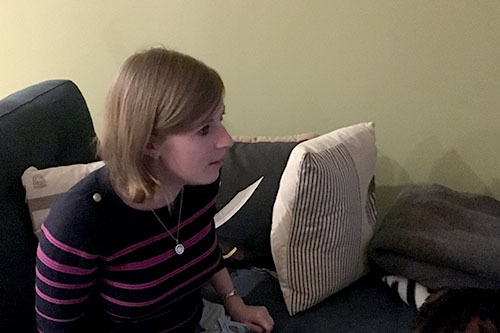 Do you support playtester with coke'n'chips and warm peluches? If not, please do: after all, that's the way we are playing games. However I was refering to *'peanut flips'*. Though their tastes differ depending on where you buy them. So I wasn't sure how to call them. Anyway I mean the salty ones, without cheese or sugar. I called them 'Bamba', even though it's a private brand which I had never tried out, since there is an article on the English Wikipedia site everyone can look it up with. Ooooh, thank you very much for the explanation!! Oh, I didn't know that. Thank you for your warning! I will keep it in mind. Wow, looks great. Thumbs up! Did the game have audio at this stage? I'd totaly take a day off, ride the Bus to Seattle and playtest the game for the day. Though, I'd rather treat it like a twitch stream, using a front facing camera and post it on youtube as a private video giving you access to it. Then once the game goes "live" change it to public and get views. But, that puts alot of faith in your playtesters. While testing, did Sarah try to do something which makes total sense in her interpretation, and would make sense for many people, but the game had no good response to her action? Does the playtesting cover such cases? Yes, she did and that is exactly what playtests are for. When you're designing a game, you get your mind on one track and then someone new comes in and tries something you never would have through of. Will Sarah do a playtest again? - or more general: will (sometimes) the same person do multiple playtests of one game? Probably the reaction of an "unspoiled" person is most valuable; however the Pizza orgies do not sound like they were a completely different crowd from one time to the next... and it could also be interesting what Sarah comments on coherency or aspects of the game that you changed since the last playtest? She will. She only played up to a minor plot point in the game, and when we're done with our next sprint, she will come back and continue where she left off. Well, hopefully she will come back. :-) Adventure games are huge and no one will be able to complete it in one sitting, so we hope to bring back the same people to continue. What she and the others can't really do is replay the same section again. Thank you for answering, Ron! That makes sense. Hey Ron, didn't see the blog in a long time, I'm glad my money seems to be well spent :) Here are some annoying questions: What about more Ambient sounds, like the typewriter at the local press? What about music in general? Do you still need a title theme? What about a title music contest? I hope that I will finally be able to open the medical cabinet in the "skeleton room". Or was there a way back in Maniac Mansion? Oh, and pretty please do also name a street "E Street". And there is a sax solo every time you enter it. It's an original poster from 1991. It usually hangs, but it was taken down because something is going to go in it's place. Ahhh ok, TP 2016 poster i'll presume, awesome! I'd swap you a rubber chicken (with pulley) for that MI poster any day of the week. So THE Ron Gilbert just replied to a message I sent. My 2015 is complete. Sooooo nice to see all the MM references in the game! I always found the characters from MM the most interesting out of all the games Lucasfilm/LucasArts released. Even though they've got almost no backstory and are only in one game. Well except Bernard. They were just a really fascinating bunch. They remind me of the different types of people from my old school. Who would have thought that the most ordinary characters turns out to be the most interesting? I know I wrote this before but it would be really interesting if Ron and Gary made a sort of "Where are they now?" on those characters. Anyway i'm really getting super psyched about the game! And i freaking can't wait for it to get finished. Those icons look really nice. Are they finished? I noticed that the color of the verbs and inventory lines changes when the game is paused. Or maybe it changes depending on the main color of the character clothes (e.g. blue, since the active player wears blue jacket and pants) ? The interface colors change based on who is selected. Great write-up! Could be extended to many different types of "playtesting", including writing novels, creating board games, etc. Will playtesters like Sarah™ be in the game's credits? May I do a new blog post? I feel empty with you guys posting only every 3/4 days. ...but today is Friday! Soon there will be a new podcast, so you can write on a new post! It's a dilemma that computer mice need a rigid underground, whereas everyone would like to lean back on a sofa. That's why mice will never be popular for video game consoles, even though they are predestined for point & click games. Have you every considered a track ball? They work rather well in that area. In my opinion track balls are not fully on a par with mice. Nevertheless it's a good idea! I should think about it. Thank you! Loved the post! Very detailed. One of the few kickstarters to actually deliver what they advertised, and more. Under promise over deliver is the key to success. Bravo. I look forward to these updates every week. I hope she had fun while playtesting at least. So... this is basically a tutorial for newb Adventure Game creators to learn every single detail that goes into the broad scene of development. In other words, this is extremely helpful as I am attempting to break into the romanticized world of game dev that is known as point & clickin'. Love the old games. Can't wait for something fresh, new and original. Been waiting for something that is just point & click and doesn't try to be anything more. So stoked for this! Out of curiosity: In every HCI and UX courses in university I was taught that you should never ever, under any circumstances, choose friends and family as part of your usability test group, do you think that this kind of testing could or does falsify your findings? Yes, that is very true, although I often start with friends (never ever family) more as a playtest of the playtest, then quickly move on to strangers. Great post Ron! I'm using this to develop a user test for a file manager app i'm working on. And when I say "using" I really mean wresting, twisting, altering, (and probably ruining) it to fit my own nefarious purposes.